Limerick and Clare played over 100 minutes of action at the Gaelic Grounds tonight. Colin Ryan was the match-winner for Limerick. 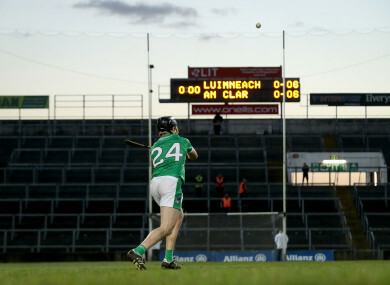 A HISTORIC SUDDEN death free taking shootout was needed after 100 minutes of hurling failed to find a winner between Limerick and Clare in a thrilling Allianz Hurling League quarter final this evening at the Gaelic Grounds. Even round one of the free taking failed to find a winner before Colin Ryan was the Limerick sudden death hero. Colin Ryan, Tom Morrissey, David Reidy, Aaron Gillane and Diarmaid Byrnes stepped forward for Limerick while Peter Duggan, Niall Deasy, David Reidy, Ian Galvin and Jamie Shanahan were nominated for Clare. All 10 scored, leading to sudden death. Peter Duggan and Aaron Gillane scored first in sudden death, then Niall Deasy struck his effort wide before Ryan was the Limerick hero. Clare led by nine points after 22 minutes of the opening half but on 52 minutes Limerick were ahead. Clare led by Peter Duggan battled back and had the lead in injury time until Ryan struck. The Banner were 0-11 to 0-2 ahead on 22 minutes with Colm Galvin, Tony Kelly, David Reidy and Conor McGrath all on the mark. Limerick went 16 minutes without a score before Aaron Gillane struck a goal. He added two frees and it was 1-4 to 0-11. Paul Browne and Gearoid Hegarty added Limerick points but Clare were 0-14 to 1-8 ahead at half time. At the mid-point of the second half Clare were still ahead, 0-17 to 0-11 with two Kelly points for the men in saffron and blue. Limerick were gathering momentum and two points from Ryan and a Gillane goal had them ahead, 2-13 to 0-18 for the first time on 52 minutes. Duggan dragged Clare back in front but that was until the third Limerick goal arrived from substitute Pat Ryan and Limerick were in front 3-15 to 0-21. Duggan then found another four points bringing him to 15-points and Clare were ahead in injury time before Colin Ryan then forced extra time. In extra time Clare appeared to hold the upper hand and points from Duggan and Kelly had them a goal ahead in injury time. Then Diarmaid Byrnes stepped forward to blast a 21 metre free to the net to ensure more extra time – this time two periods of five minutes. The excitement didn’t end there. The sides were still level at half time in the second spell of extra time and it appeared John Conlon was to be the Clare hero until a late, late free from Gillane left the sides level after 100 minutes – Limerick 4-21 Clare 0-33. Scorers for Limerick: Aaron Gillane 1-11 (0-11f), Diarmaid Byrnes 1-1 (1-1f), Pat Ryan 1-0, Colin Ryan 0-3 (0-1 sideline cut), Gearoid Hegarty 0-2, Cian Lynch, Tom Morrissey, Paul Browne, Seamus Flanagan 0-1 each. Scorers for Clare: Peter Duggan 0-19 (0-15f, 0-2 ‘65), Tony Kelly 0-6, David Reidy and John Conlon 0-2 each, Conor McGrath, David Fitzgerald, Shane O’Donnell, Colm Galvin 0-1 each. Email “Limerick's Ryan hero in free-taking shootout as Clare's Duggan scores 0-19 in thrilling hurling quarter-final”. Feedback on “Limerick's Ryan hero in free-taking shootout as Clare's Duggan scores 0-19 in thrilling hurling quarter-final”.